Trending colors for interior design are fun to watch. One interesting thing to observe is how the different color and paint companies differ in what they claim will be the color of the year. This year is no different. Among the paint companies, you’ll see some variation. For instance, Sherman Williams is touting their Oceanside SW 6496 (think of it as a rich blue color with jewel-toned green) as their color of the year. On the other hand, Benjamin Moore (as usual) offers a wider palette of colors rather than one single choice for 2019. 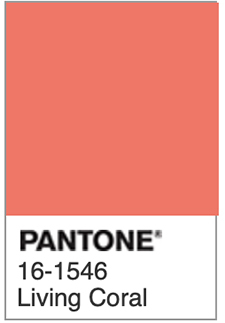 And while they are not specifically focused on interior design, the folks at Pantone have selected Living Coral (pictured here) as their color of the year. Don’t be surprised to see this popping up as an accent color through a lot of homes (as well as showing up as an accessory color for clothing). One broader trend that has taken hold (and seems to still be gaining traction) is the use of multiple colors in kitchen cabinetry. As we look through kitchen trends we’re seeing more and more use of a mix of contrasting light and dark upper and lower cabinets. When it’s done tastefully, it’s pretty dramatic. Kitchen and bathroom remodeling always make up a significant percentage of the home remodeling projects we do. That’s true for other remodelers as well, because those two rooms are so crucial to creating an inviting and comfortable home. There are some interesting trends surfacing in overseas markets that will very likely influence home design here in the States. At the recent (September 2018) Cersaie Fair in Italy, attendees observed emerging trends such as personalized and streamlined bathrooms, increased use of mix-and-match tile work, slim whirlpool tubs, and easy-clean toilets. You can read about the details here, in an article from Houzz.com. We’ve already mentioned that kitchens are always a high priority for remodeling. That’s really no surprise when you consider how the kitchen has become the center of both family activity and for entertaining in the home. Even though this isn’t a new trend, it shows no sign of letting up. NPR even featured this topic/trend recently in a piece entitled, Why Modern-Day Guests Always Gather In The Kitchen. 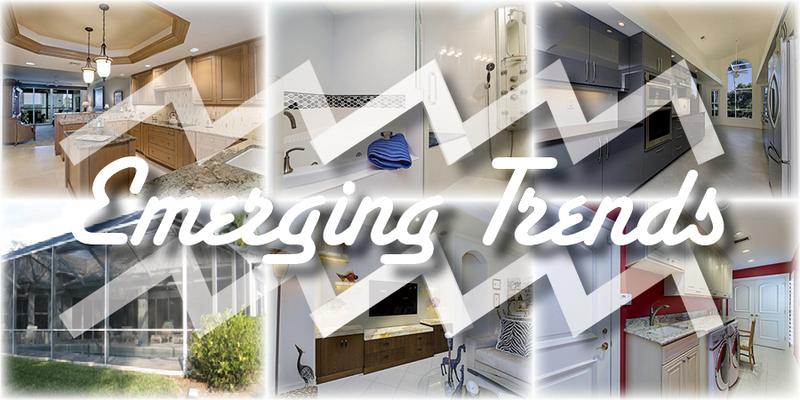 So what are some of the more current trends when it comes to kitchens? Keep in mind that remodeling trends to change as quickly as “The Color of the Year.” They take longer to develop—and true trends tend to stick around longer—and evolve. One such trend is the emergence of the kitchen island as a prominent feature. No doubt you’ve seen its popularity grow. What’s interesting, however, is how homeowners are adapting the kitchen island concept to their particular situation. Not every kitchen can accommodate a massive kitchen island in the middle of the room. But because these features are so practical (and good-looking) islands are popping up even in smaller kitchens. That’s helpful if you want to remodel a condominium where space is at a premium. If you’re looking for kitchen ideas (with or without an island) take a look at some of the kitchen remodeling projects we’ve worked on recently in the Naples area. Popular interior colors will change from season to season. Materials for countertops and cabinets will shift over time (by the way, there is some pretty significant movement away from granite in favor of quartz for countertops in kitchens and baths). Appliance finishes will continue to evolve (and even though black stainless has made inroads, you’ll continue to see a lot of stainless surfaces for a while). Great design will trump fading fads every time. That’s why we encourage you to contact us to talk through your plans and ideas for your Naples home remodel. We'll help you create a home that not only looks great but also reflects your personal lifestyle and makes you comfortable.